With Talib Kweli, Junot Diaz, Lisa Dierbeck, Wahida Clark, Barbara Parsons, Sean Dalpiaz, and Wally Lamb. Program edited and produced by Cara Benson. PEN Members and special guests read award-winning selections from the PEN Prison Writing Contest at its Third Annual Fundraiser and Raffle. 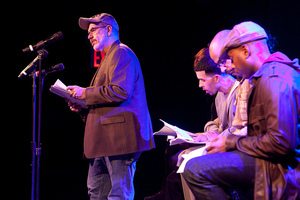 Proceeds from the event and raffle help ensure that PEN’s hallmark program continues to promote the restorative and rehabilitative power of writing by providing hundreds of inmates with skilled writing teachers, free Handbooks for Writers in Prison, and a forum where inmates are encouraged to use the written word as a legitimate form of power.